I have come across people who put in efforts to shut down each and every app completely. Apps tend to stay in the background after you press the home button to exit them. I was also one of those people. I used to spend few minutes every day swiping out all apps running in the background. I even installed task killer program for my Android device. Sometimes I even restarted my phone to reduce the pain of manually swiping a large list of apps. 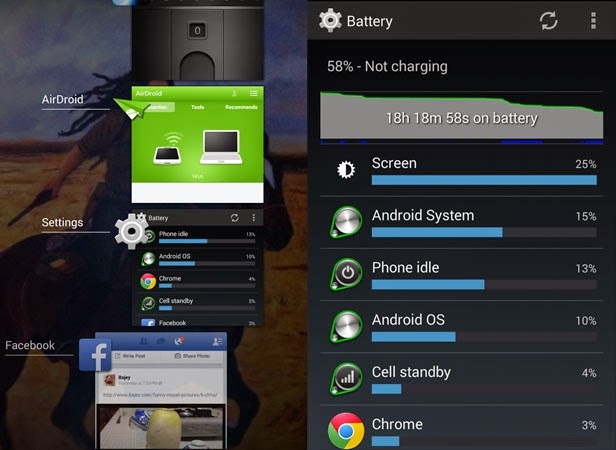 The reason behind this is to hopefully cut down on battery usage so that my juice can last for a long time. But as it turns out, this is absolutely unnecessary. Smartphones and tablets these days are so smart that you don't have to shut down apps completely. It is true that they remain in the background until you exit them. This may lead us to believe that those apps are consuming our memory (RAM) and hence more battery power is in use. But it doesn't happen. Your phone is smart enough to manage its own memory. This is the first thing that you must understand. When you have apps in the background which are doing nothing, they are not consuming any resource. Only if they are actively using your GPS or playing some music, then you can say that they are using your battery. Otherwise, they are just sitting there doing nothing while remaining dormant. Even if you close or kill apps running in the background, if required, those apps still have their services up and running. For example even if you kill your Facebook app, its services are still listening to notifications that you might receive. That is why, even though an app is closed, you still get notifications. This means it’s impossible to stop apps from running in the background just by swiping them away. On your device you have a certain amount of memory. I am not talking about internal disk space. I am talking about RAM or the main memory where your running apps and processes are stored. 2 GB of RAM seems pretty normal these days for smartphones. That is a huge amount of memory. It should be noted that just because you left a large portion of your RAM unused, you will save power. Unused RAM is just wasted RAM. You have to think that in this modern age of technology and equipment, you are required to close down apps just so your smartphone can save some power. That is not true. Your smartphone is not called smart for no reason. It is really smart and is capable of managing apps in the background itself. It can manage its own memory. The apps that you leave in the background are launched quicker when compared to launching them fresh. Extra launch time means your app needs to do extra things like log in and check for other stuffs that are performed during start-up. This will consume slightly more process and battery than running an app that is already there in the background, ready for your command. In the end it is now clear that you do not have to clear out background apps. They do no harm. Having that said, there are certain apps that are not well built which require you to "Force Stop" them. These unstable apps are known to consume a large amount of battery even while staying in the background. You can check your battery usage stats to discover these kinds of apps.